In the spring of 2015, we added to the Hayes Homestead with our new chickens! As new chicken owners, we are definitely learning as we go. 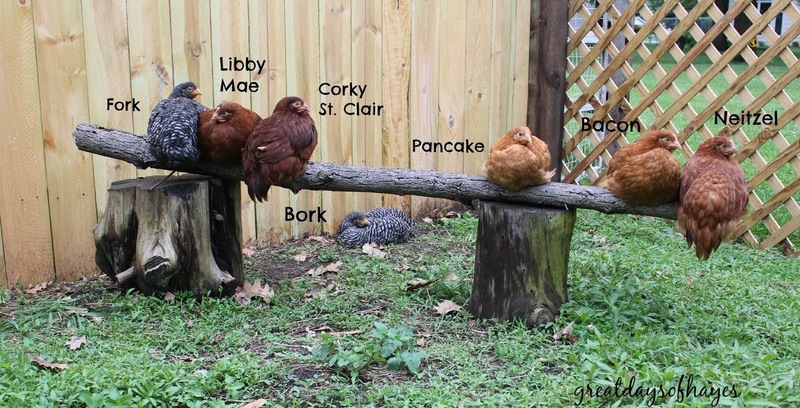 Use this page as a quick reference to any and all things I post about our chickens. Chick Fever - Our plan was for 8 new chicks....but we ended up with 12! Moving the Chicks - Part One - We took the first step at integrating our 12 small chickens into the run with our two big chickens. And Then There Were Five - The loss of one of our hens prompted some needed updating to our chicken run. Keeping Chicken Water Thawed without Electricity - I have a couple of tips to help your chicken water from freezing solid during the cold winter months. Separating and Reintroducing Chickens Within your Flock - When chickens are injured, sick, or being bullied they'll need to be separated. Reintroducing them is not always easy. Chicken Run - Part Two - Jason has put a lot of work into our chicken space this summer! Extended Chicken Run - Part One - An exciting addition to our homestead for our flock! We've Got Chickens! - We knew we wanted them eventually, and decided now was the time. One Month - An update on our chicks. Hard to believe we've had them for one month already! Chicken Coop Progress - We finally have the coop finished enough for the ladies to move in. Yay! Lots of cool features on this post!! Coop Training - When we first moved our ladies to their coop, we had to train them to go inside at night to roost. Chicken Feed Gauge - We are able to see how much food the chickens have without going inside the coop! Meet Our Ladies - They're finally named!! Pavlov's Chickens - We have successfully trained the chickens to come when we knock on their door! Egggg-citement! - Finding our first egg!! Mobile Chicken Shelter - A place for our chickens to happily graze in our yard without worrying for their safety! A Dog and His Chickens - Oliver loves our flock! !